My month in Bali was charming and relaxing—a great rest from my second trip around the world by local transport. It also involved a lot of bugs. Night would bring insects into my room—and they’d find their way through tiny holes in my mosquito net. Evenings in the rice paddies were cool so I didn’t need A/C, but I rapidly learned the value of screens. No more bungalows without screens, I realized. And sometimes there were frogs. Not in my mosquito net—maybe not even in my bungalow. Were they just below in the garden? I could never tell—such small frogs make such loud noises. I also met several dogs over my month. A black dog roaming the grounds of the rice fields near my bungalow was precisely named Blackie, and the house dog at the organic Japanese deli across the road kept giving me his paw to beg for a taste of my lunch. But I was eating brown rice and radish. Is that dog food? I wasn’t sure. Then there were monkeys. No, not in my bungalow or even in my part of town, Penestanan. 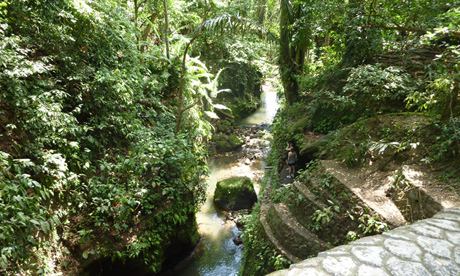 But rather down the road at the other end of Ubud, which is home to the Sacred Monkey Forest—a park dedicated to a small forest containing temples and monkeys. Lots and lots of monkeys. 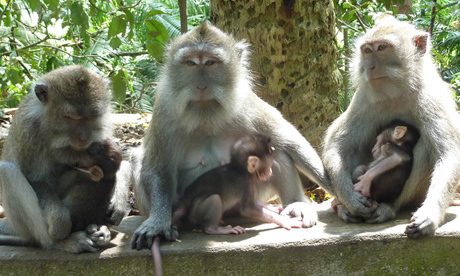 Sometimes, I think there were as many monkeys as there were tourists in Ubud, but there aren’t, not really. The monkeys were just more verbal and demonstrative. They’d chase each other, beg for snacks, and aggressively demand bananas. I kept out of their way the one day I headed down to the Monkey Forest to shoot video. Monkeys never seem to understand they’re smaller than people, or maybe it’s that they know we don’t want to hurt them. They can be bullies. Most of the time, I just passed around the Monkey Forest. 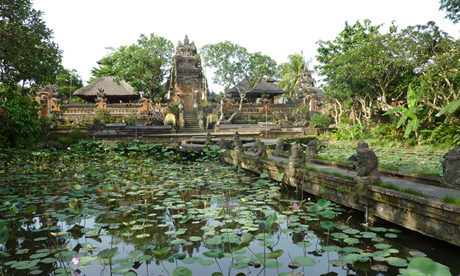 I’d been in years ago on my first trip to Bali in 2000, and it’s set at one end of town, where I seldom ended up. 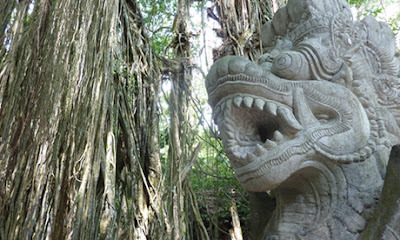 I‘d skirt around the sacred area as I went about my daily life in Ubud. I usually had somewhere to go—the bus stop, the salon, a coffee shop, the store. Or even to the pub. 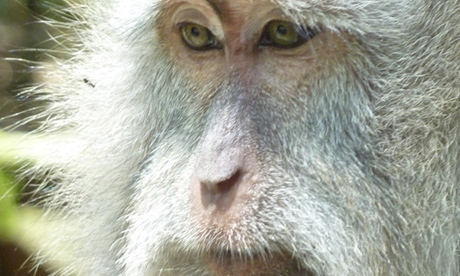 After my week of volunteering at the writers festival, I had met several resident expats of Ubud, who introduced me to amusing local characters. The scene centered around evenings in a pub alongside the town football field, and most of my new pals had ended up in Bali for the culture, inexpensive lifestyle, and support of their arts. Everyone seemed to be a writer, painter, photographer, or patron of music or dance. And they’d tell me stories about the characters in the book “Eat, Pray, Love,” or talk about their villas or projects or their travels. My favorite evenings were watching the expats argue with each other about conspiracy theories. One subscribed to pretty much any available conspiracy theory. Another would roll his eyes and try to change the subject, but one man would get tired of the crackpot ideas and take the other to task. The ensuing argument was sometimes entertaining and other times tense, but I was always happy when the subject turned back to someone’s painting. One of these evenings, the conspiracy theorist told me I had a blockage in the left side of my head. “Too much thinking,” he explained. He put his thumb on my left temple and made an effort at pushing the blockage out. I’m not sure it worked. On my last night in Bali, I said good-bye to the group of expats at the pub. I looked at this quirky group and smiled. I wanted to say “Next year!” Part of me wanted to get a (screened) bungalow and a motorbike to lose myself in writing and organic smoothies, in yoga and conspiracy theories. But I didn’t say anything. I don’t know when I’ll go back. I’m not done yet with the larger world. I’m an urban person—but could I live in a little town in Bali? Yes, I think I could. For a while. I walked over to the edge of the football field, keeping an eye out for Nyoman, my motorbike-taxi driver. He sometimes waited for fares here at night, but he’d been hard to find since an Australian woman he’d driven around town for three days had given him a Blackberry as a gift. I’d been looking for him. We’d both been so excited about the Blackberry the night he’d gotten it, I’d forgotten to pay Nyoman. And I couldn’t well ask around for him. There are a lot of Nyomans in Bali. Every first-born child (male or female) is named Wayan or Putu. Every second-born gets named Made or Kadek. Third-born is Nyoman, and so on. If I were to ask for Nyoman the motorbike driver, I wouldn’t get very far. I walked up to the little storefront where his mother sold mangoes. But I was no longer sure this was his mother—she could be an aunt, a friend, a cousin. “Where is Nyoman,” I asked her. She made a call and then said “He is sick.” She made another call and a moment later, a young woman pulled up on a motorbike. And so Nyoman’s sister (or whatever—due to my language limitations, I’m not always sure I understand situations correctly), drove me back up to Penestantan and dropped me off in front of the path through the rice fields to Gerebig Bungalows. I finished packing and surveyed my room before going to bed where I’d fight mosquitoes. But it had already been a month. My rest was over and it was time to resume my trip around the world. Time to head to the airport for the flight back to Bangkok.